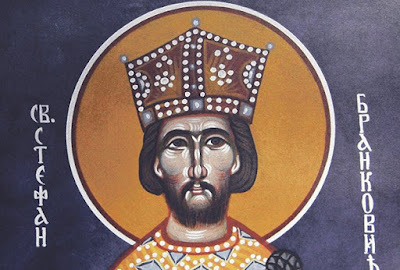 Saint Stephen Brancovich (Branković) was the son of the Despot Durad Brancovich and Queen Irene Kantakouzene, a granddaughter of Emperor John VI Kantakouzenos, and lived in the fifteenth century. He and his sister Mara lived in the court of Sultan Murat II. Saint Stephen and his brother Gregory were blinded at Jedrene in 1441 by the Turkish Sultan for some perceived offense. Since he was innocent, he bore his affliction with courage. 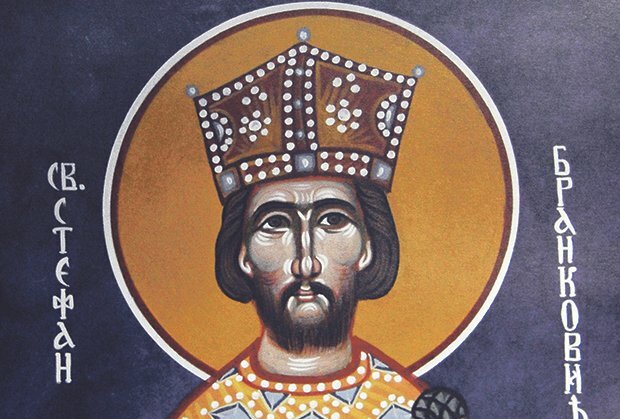 Stephen became ruler of Serbia in 1458, but was soon forced to flee to Albania in 1459. He was not only Prince George Skenderbeg’s guest, but he was also treated as a member of his family. There he met Angelina Arianit Komneni (July 1 & 30 and Dec. 10), the daughter of Prince George. Not surprisingly, Stephen and Angelina eventually fell in love. With her parents’ blessing, they were married in November of 1460. After a few years, they were blessed with two sons: George and John. When the boys were grown, Stephen and his family were forced to flee to Italy for their safety, because the Turks invaded Albania and began to slaughter men, women, and even children. He died as an exile in Italy on October 9, 1476, and was buried in Serbia in the Monastery of Krushedol in Frushka Gora, which was founded by his son the monk Maximus. After eight years, Saint Steven’s relics were uncovered and were found to be incorrupt and fragrant. Many miracles took place at his tomb. Saint Stephen is also commemorated on December 10 with Saint Angelina and Saint John. John was married, but had no sons. He died in 1503 at a young age, and many miracles took place before his holy relics. Saint Angelina survived her husband and both of her sons. Mindful of her soul’s salvation, she entered a women’s monastery. She departed to the Lord in peace, and her body was buried in the same tomb as her sons in the Monastery of Krushedol.